Nautica Po designed and constructed the Sea World with a very good quality/price ratio in mind. The boat offers top-performing capabilities combined with excellent livability solutions for her size. In addition, she comes with a complete set of standard and innovative fittings. The Sea World is a 30' cabin motor yacht designed, built and sold by the Nautica Po - a well-established yard with a consolidated shipbuilding experience of leisure yachts for third parties. This commercial act of courage relieves the user of additional costs and offers him/her only exclusive quality and professionalism. The hull of the Sea World, the best-shaped hull existing on the market of fishing boats, was designed with extraordinary stability and trim characteristics that apply to any situation and sea condition. The hull combined with the perfect choice of in-line transmission, the ergonomic distribution of weights onboard and the intentionally extra large rudders offer the maneuverability typical of stern drive legs. As a matter of fact, I had the possibility of testing the boat's capabilities: sharp turns and very easy maneuvers when still by using only the reduction gears. The Sea World is a really excellent boat. Her qualities include superior design and livability as far as interior and deck arrangement is concerned: the cockpit is comfortable and well proportionate, the coachroof has well positioned handrails. 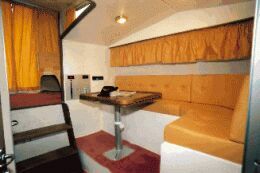 Interior arrangement includes a double dinette (the lower one may be converted into a double berth), a very comfortable and light forward separated double cabin and an equally comfortable and spacious bathroom. On request, a second cabin may replace the lower dinette. The interior helm station is well fitted and easily accessible. At the beginning we mentioned the excellent quality/price ratio and the complete and original set of standard fittings. As a matter of fact, Sea World is probably the first yacht to be fitted with standard solar cells in order to be independent from the 220V dockside connection during the summer season. Sea World is an extremely interesting boat and I strongly suggest a sea trial in order to verify on the spot the maneuverability and livability qualities of the yacht, which, I am sure, will not disappoint you. Full load displacement: 10,154 lbs. Engine weight without reduction gears: 1,633 lbs. Standard fittings: solar cells on coachroof, 700W electrical windlass, multi-purpose echo- sounder, speed indicator, electronic 20 A battery charger, 3 batteries, 12/220 V plants, panel with switches, hydraulic or mechanical steering depending on the version, full instruments, compass, 20- gallon refrigerator with box plate, shower on deck, water heater, aft platform and swimming ladder. Hull construction material: RINA approved isophtalic fiberglass (3/4"-thick in hull- 50% thicker than the actual thickness required by RINA). The Sea World hull is based on the hull of the sister ship Sea Fish, a professional fishing boat with excellent performing capabilities. 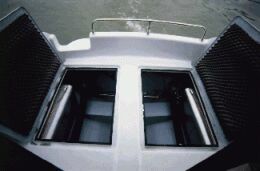 Bulkheads, cabinet and interior finishing are in marine plywood (thickness varies between 1/4" and 1"). Stainless steel deck hardware (all with through bolts and backing plate). 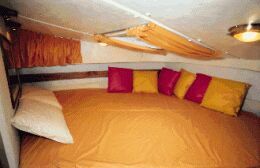 Thai solid mahogany and solid teak, interior lining in microfiber fabric, cotton upholstery, ceiling with wooden strips, colors on request. 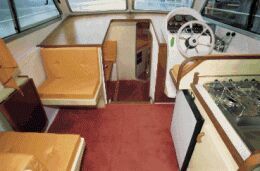 Deck materials and characteristics: bow platform, bow fitting for anchor and anchor chain, bow pulpit, mooring bitts and fairleads, 4 handrails on deck, coachroof with inflatable raft storing space, solar cells and antennae, aft platform (access from the cockpit) fitted with swimming ladder and shower. 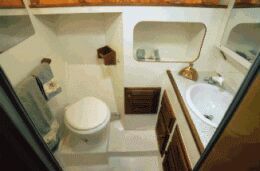 Below deck: higher and lower dinette (higher dinette with folding table, lower dinette may be converted into double bed), helm station, covered galley aft of helm station settee features range, cabinets, refrigerator and sink, forward cabin with double berth and settee, separated bathroom.